Stock # NEB39584, Intercooled Turbo Diesel V-8 6.7 L/406, Automatic, 36263 mi. CARFAX 1-Owner, LOW MILES - 36,267! 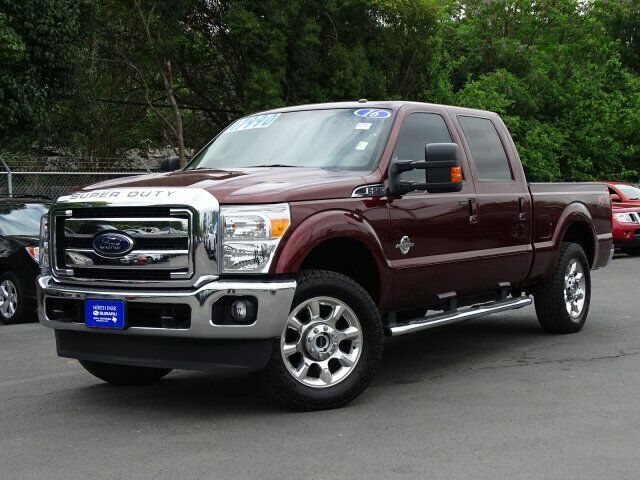 Heated Leather Seats, Moonroof, Nav System, ENGINE: 6.7L POWER STROKE V8 TURBO DI... ELECTRONIC LOCKING W/3.55 AXLE RATIO, 4x4, Back-Up Camera, Hitch, Turbo Charged Engine, POWER MOONROOF SEE MORE! Leather Seats, 4x4, Back-Up Camera, Premium Sound System, iPod/MP3 Input, Bluetooth, Trailer Hitch, Dual Zone A/C, WiFi Hotspot, Heated Leather Seats. MP3 Player, Keyless Entry, Privacy Glass, Steering Wheel Controls, Electronic Stability Control. ENGINE: 6.7L POWER STROKE V8 TURBO DIESEL B20: 4 valve OHV, manual push-button engine-exhaust braking, turbo gauges and intelligent oil-life monitor, 3.31 Axle Ratio, 26 Gallon Fuel Tank, Dual 78-AH 750 CCA Batteries, WHEELS: 20" PREMIUM CAST ALUMINUM: bright hub covers/center ornaments, POWER MOONROOF: map lights and moonroof switches, VOICE-ACTIVATED NAVIGATION: HD and satellite broadcast, LARIAT INTERIOR PACKAGE: Memory PowerScope Trailer-Tow Mirrors, Remote Start System, Power Heated/Cooled Passenger Seat, Memory Power Heated/Cooled Driver's Seat, easy-entry/exit memory driver's seat feature, Memory Power Adjustable Pedals, ELECTRONIC LOCKING W/3.55 AXLE RATIO, TAILGATE STEP & HANDLE, HEATED REAR SEATS, FX4 OFF-ROAD PACKAGE: unique FX4 Off-Road box decal, Colored Front & Rear Rancho Branded Shocks, Hill Descent Control, Transfer Case & Fuel Tank Skid Plates, UPFITTER SWITCHES (4): Located on instrument panel, ORDER CODE 608A. Ford Lariat with Bronze Fire Metallic exterior and Adobe interior features a 8 Cylinder Engine with 440 HP at 2800 RPM*.